board in the backyard found my baby boys foot...or rather his foot found them on Monday. My poor little E Bug was stuck so badly that I had to pull him free. Thank heaven he is up to date on his tetanus shots. We still made a fast trip to the doctor and got him seen about. Have you ever had one of those days where you remain totally calm on the outside, but on the inside your flipping out?? ?...yeah...that was totally Monday for me. Of course E picked 12:30 to step on the board, so the Dr's office was closed for lunch. I got him cleaned up and bathed he and L and got all of the kiddos ready to go with full knowledge that we'd be either going to the Dr or to the ER as soon as I spoke to the nurse, but when she called me back she said that they were booked up for the afternoon and I should, and get this all you other mom's, I should go to the ER and then IF they decided that he needed a tetanus shot I could call back and schedule an appointment for the following day with his dr's office. Well, I don't know about you guys, and I'm not sure how your ER's work, but I am an extremely busy woman. I blog, I crochet, I keep my house and 2 other houses on the side, I take in laundry, and I care for my 3 beautiful children, one of which has severe, life threatening food allergies...so it's complicated and time consuming. I don't just have time to sit for 2-3 hours in the ER and then drive across town again the following day and sit in the Dr's office for an hour. So, as you can imagine, I was a little frustrated with that suggestion. I was very calm and sweet and I said, "I'm sorry, I don't mean to be contentious and I trust the nurse and will do what she thinks is best, but can you ask her why she wants me to go and sit in the ER with all of my children today and then come back into your office tomorrow?" Suddenly, and quite conveniently for me, there was a cancellation and we were able to get E in to see the Dr and start a round of antibiotics. While we were at the dr's office L peed through his clothes (He does that in one pee!!) and guess, just guess what I was completely out of in the diaper bag!!!!!! I'm that mom. That crazy wierdo mom that carries a huge diaper bag and has everything from neosporin to a change of socks for my potty training kiddos and a baggie to put the wet things in. It was so foreign to me to be without a diaper that I nearly fell to the floor in tears. You should have seen the dr's face. She could tell that I was having a completely off day. I just looked at her and said "I guess everyone has to have their off days once in a while." and she nodded and brought me a diaper. So, to make a long story only slightly longer, Monday poured over onto Tuesday a tiny bit, but by 4:30pm things were finally normalizing again. 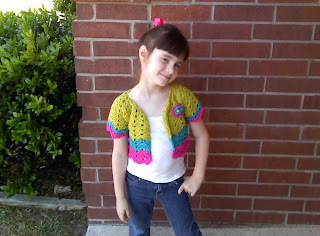 On a crochet note, I got the drawing prize mailed out and I crocheted a short sleeved summer cardigan for B. I used this pattern which I've used before and love! I made a couple of variations to it to make it fit B, and I made a flower for the lapel, and didn't it turn out darling?! !